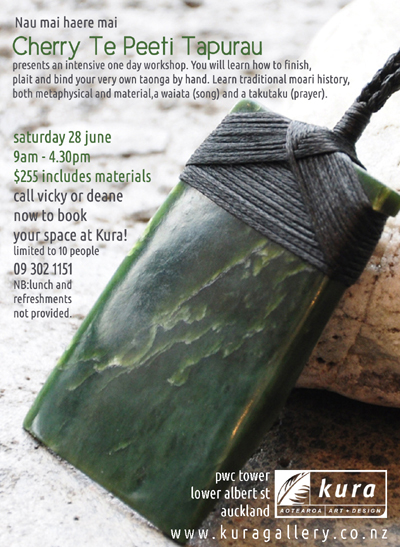 WORKSHOP Auckland – One day pounamu workshop with Cherry Te Peeti Tapurau – Kura Gallery: Maori and New Zealand Art + Design. This is a unique opportunity to hand finish your very own quality toki pounamu. An ideal taonga to keep in your family or pass on to someone special. This workshop is designed for 10 people, so call now to secure your place. Cherry Te Peeti Tapurau presents an intensive one day workshop where participants will learn traditional Maori history, both metaphysical and material, and be taught a waiata (song) and a takutaku (prayer). Partipants will also have the opportunity to learn how to plait, braid and finish by hand, their very own taonga. The workshop will function in the manner of tikanga and kawa. Cherry is a self-taught artist, a descendent of Ngai Tahu, Ngati Tuwharetoa, Kahungunu and Rangitane. She has created art for more than 20 years in a variety of media but now works solely with pounamu. Cherry was a sole student of one of New Zealand’s most influential and respected contemporary pounamu carvers – Te Kaha.